Su Casa is a newly renovated, spacious cottage located within a short walk to the beautiful beaches of Byron Bay, unique shopping precinct and it's many delectable cafe's and restaurants. The 2 bedrooms have queen size beds, main with ensuite and the second bedroom has easy access to the main bathroom and toilet. The lounge room is extremely generous in size and can be closed off by glass sliding, timber panelled doors if you wish. Large flat-screen tv's and comfortable couches are there to tempt! The Kitchen, with all the mod cons, overlooks the dining room which has been wallpapered in a cool geometric design for a funky effect. Both kitchen,dining and lounge rooms all look out to the large leafy garden which surrounds the house. 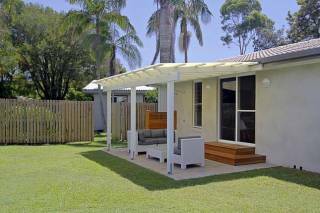 An outdoor setting / BBQ is also situated in the garden to maximise the glorious Byron Bay weather! If you have another group wanting to stay close why not inquire about our sister property next door called Mi Casa- sleeps 7. There's a gate that joins the properties for easy access.